After spending eight months in Rikers Island in New York, Lil Wayne was finally released from prison on November 4th. As his legions of fans counted down the days until Dwayne Michael Carter, Jr. would once again be a free man, Wayne’s mind was on bigger things. Wayne had two main goals upon exiting Rikers Island: return to his family and friends, and become an even bigger superstar. Rumors spread that Wayne would join Drake in a concert in Los Angeles the night of his release, but the Grammy Award winning 28 year old instead decided to go home to Miami to see his children and friends. But his fans knew that one day very soon, the New Orleans native would stand tall on a stage in front of thousands of his fans performing the hits that made him famous. That day came Saturday, November 6th. Drake, who was continuing his tour, entered his concert in Las Vegas, Nevada with a surprise up his sleeve that would leave his audience with a night they would never forget. On the final night of the Light Dreams and Nightmares tour, Drake presented to the world the return to the stage of his mentor and co-member of Young Money, Lil Wayne. 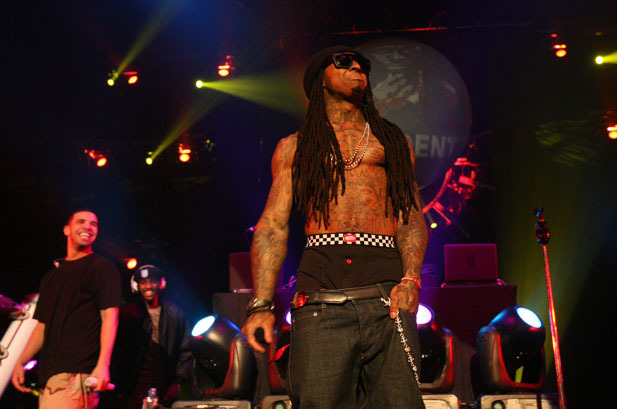 During the performance of “Miss Me,” a hit song from Drake’s “Thank Me Later” album, which is a collaboration between Drake and Wayne, the artist known as Weezy hit the stage. The already exited crowd managed to get even louder. Lil Wayne then left the stage leaving the crowd in an uproar chanting “Weezy” in honor of the man who released albums like “Tha Carter III,” “I Am Not A Human Being,” and numerous mixtapes. With dreadlocks longer than ever and a respect for life greater than before, Lil Wayne is now officially back. Reports have the rapper already hard at work at “Tha Carter IV” as well as other projects with both Young Money artists and as well as other artists, both current stars and new performers. As Wayne is now free, fans now have the pleasure to watch and see just how bright Wayne’s star can shine in the coming years. Click here for the Youtube video of Lil Wayne Vegas performance. i love everything abt lil wayen, i love lil wayen. we missed our rap ster “weezy” an now that he is back the aint no other nig*** that will tell him isht… i min he survived hell which makes him the fitest hala back to weezy “yeaza” .now ma last words f**k the motherf****rs who think they are the isht bt never been to jail hala back.